Let’s talk a little about salads. 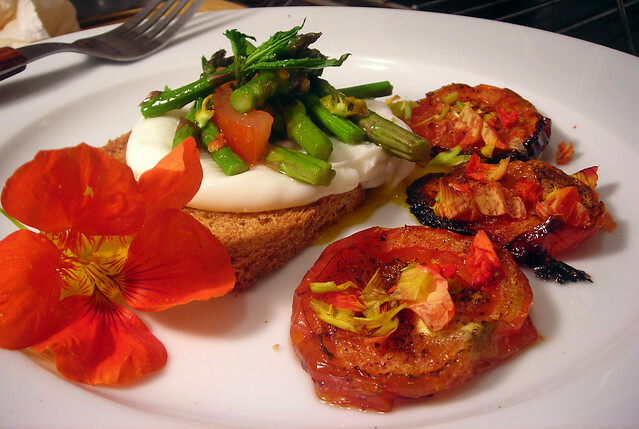 In Europe, the salad course typically takes place after the main course, but before the cheese course or dessert. It serves its function as a palate cleanser, and prepares diners for the conclusion of a multi-course meal. Here in the United States, when salads are thought of at all — if part of a multi-course meal, salads are served either as an appetizer, after the appetizer but before the main course, or as an accompaniment to an entrée. Sometimes, a salad can be so substantial that it itself becomes the meal. I think that salads (as in a salad course) are a “lost” art in the U.S. There are some principles which should be considered if you’re planning to feature a salad course as part of a meal. For instance, if a salad is being used as an appetizer, or if it will be served prior to the main course, it is of paramount importance that the flavors and textures be balanced in a way that would prepare a diner for the next course. A light vinaigrette with a low acid base (i.e., lemon juice) is usually used so as not to overpower the palate for the next course. 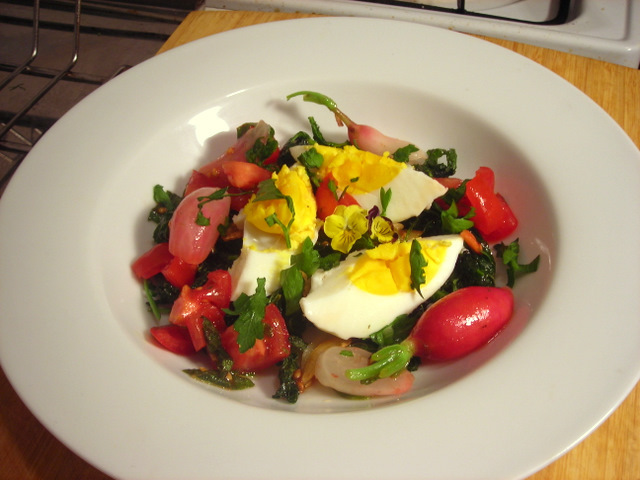 Salads used as main courses usually will have two or more dominant ingredients that blend together and are typically the main flavor focus on the menu. For example, a salade niçoise will have predominantly salty and pungent flavors due to the presence of oil-packed tuna, anchovy and Niçoise olives. In this specific case, a dressing with a higher acid to oil ratio is used. Too many people will resort to the same old iceberg or romaine lettuce. I think that a bowl of salad should give you license to innovate or create. In addition to the usual standbys, consider using lettuces such as endive, butter or Bibb lettuce, mesclun or arugula. You can include various types of greens like chicory, watercress, puntarelle, spinach or turnip greens. Each of these has a distinctive flavor and texture, from soft and buttery, to crisp and sweet, to peppery and pungent, to pleasantly bitter. In combination, the sum of their parts elevates a salad to an elegant whole. I belong to the “minimalist school” of salads. Rather than toss in the kitchen sink, I prefer to focus on only a few ingredients, the better to showcase them. There is no better example than today’s offering, insalata di funghi, or “mushroom salad”. The rule here, as with most salads that use only two or three ingredients, is that the less elements there are, the more important their freshness becomes. You need high quality ingredients, or this salad won’t work. * You can accomplish this by shaving thin slices of cheese with a vegetable peeler or a very small, sharp knife. 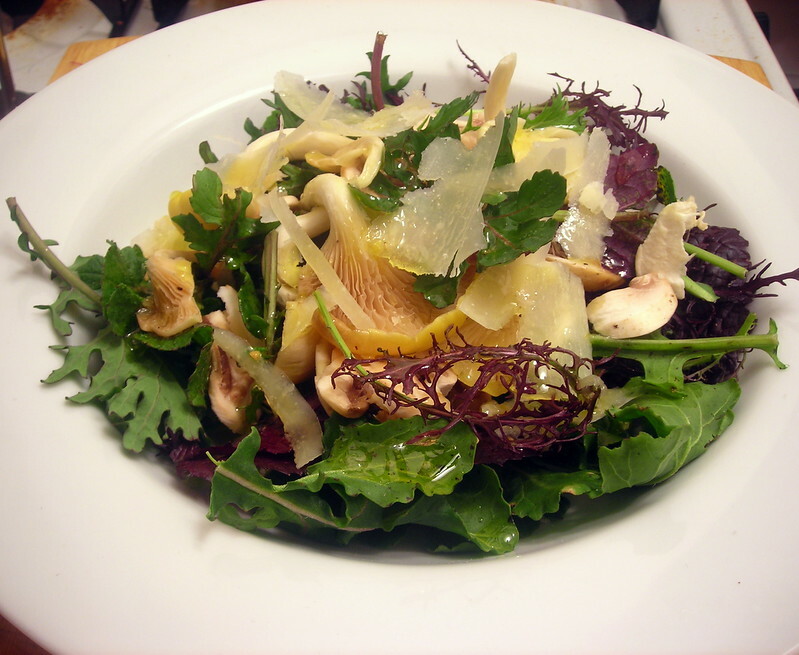 Combine mesclun greens, button mushrooms and oyster mushrooms, and shaved cheese in a large bowl. Toss. In a separate smaller bowl, whisk together the olive oil, lemon juice, sea salt and black pepper. Lightly dress the salad with the vinaigrette. Toss once more, then spoon salad onto individual salad plates. Serve immediately. Time: About 20 minutes, including prep. P.S. to all readers: If you ‘like’ this post, can you please let me know what it is you liked about the post instead of merely hitting the “Like” button? Your feedback is appreciated and will help me make the blog become even better. I don’t want to sound ungrateful. “Liking” this or any other post means that you ‘liked’ it enough to press the ‘like’ button, but it tells me nothing about what you found attractive. Was it the writing? Was it the photography? Was it the recipe? Would it inspire you to try this recipe in the future? Thank you for your time and your support. 20 Dec	This entry was published on December 20, 2012 at 2:15 pm. It’s filed under food, food photography, Gluten-Free, Italian food, recipe, vegetarian, winter and tagged food photography, gluten-free, Italian food, mushrooms, salad, vegetarian, winter. Bookmark the permalink. Follow any comments here with the RSS feed for this post. Thanks, Mike. Is there anything that you’d like to see improved? I love this topic. i’m actually going to be teaching a class on salad making 101 at Williams Sonoma this month. Super Excited. Nice Photos!